In doing something it hadn’t done all night, Master’s hoped to avoid doing something it hadn’t done in more than two years. Darryl McDowell-White’s corner three with 36 seconds left in regulation Saturday spotted the Mustangs a one-point lead over William Jessup. It was TMU’s first make in 12 tries from beyond the arc, and it embodied the fearless mentality the club showed in overcoming a double-digit halftime deficit. But after Hansel Atencia extended TMU’s lead with a pair of free throws, Jessup’s Tyras Rattler Jr. completed a three-point play with 13 seconds remaining, and Master’s eventually lost in double overtime, 90-84, inside Warrior Arena in Rocklin. It marked the first time No. 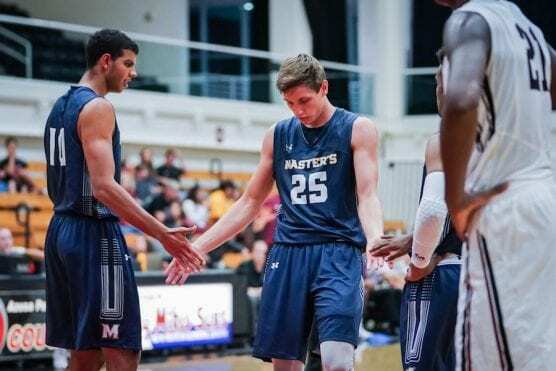 7 TMU had dropped back-to-back games since January 2017, and it set the Mustangs back in their chase of a repeat Golden State Athletic Conference title, if only slightly. First-place Vanguard beat Ottawa Arizona on Saturday, moving the Lions a game and a half ahead of Master’s (19-5, 8-4) and No. 18 William Jessup (17-7, 8-4), which are tied for second place. Saturday, TMU leaned heavily on center Tim Soares in the first overtime. Soares scored seven of his 19 points in the period, hitting all five of his free throws before fouling out with 1:24 remaining. Master’s would miss the 6-foot-10 junior’s presence in the final period, when the Warriors went 4-of-5 from the floor and looked to a familiar player in crunch time. Rattler Jr. drove for a layup with 48 seconds on the clock, extending Jessup’s lead to four. Master’s turned the ball over at the other end, all but sealing the Mustangs’ most painful defeat of the season. Master’s trailed by 13 at the break, not unlike Thursday when it fell behind at Menlo by 16 at intermission. Coach Kelvin Starr said then that overcoming double-digit deficits on the road requires near flawless play. Master’s clawed its way back into this one with gritty defense. The Mustangs held William Jessup scoreless for the first six and a half minutes of the second half — finally pulling ahead with just under 10 minutes to play. There would be no breathing room, however; only heavy breathing on the part of any Mustang fan even mildly invested. Rattler Jr. finished with 21 points, and Jessup’s Darrell Polee added 18, hitting fall-away jumpers at several crucial moments. Delewis Johnson’s three-point attempt at the end of the first overtime was on line but ultimately rimmed out. And Atencia’s layup with 3:35 to play in the second overtime gave Master’s a one-point advantage. But Jessup closed the game on a 10-3 run.